C & G Distributors, Inc. is a family owned and operated corporation. It was established by my father in 1973 and incorporated in January 1987. Its primary business is the wholesale distribution of residential/light commercial equipment and supplies to HVAC/plumbing distributors and contractors. Over the years our business has grown and so have the number products we offer. Our clients have access to over 50 of the leading manufactures for products and supplies. 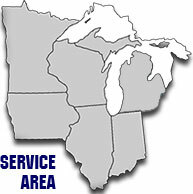 Our distribution center is located just Southeast of the University of Wisconsin Arboretum at 2580 Todd Drive, in Madison, Wisconsin. Please take time to look over our site and find out why professional contractors are purchasing their products from us. Thank you for your time and consideration. We look forward to being of service to you!